Bring On Tomorrow Co. and Kay Meek Centre warm up the winter season with Little Women, Dec. 27 – 30 in the Grosvenor Theatre at the Kay Meek Centre. Set in 1860s New England, Little Women follows the four March sisters – hopeless romantic Meg, aspiring novelist Jo, kind-hearted Beth and self-centered Amy – on their journey from childhood to maturity during the American Civil War. From the producers of 2016’s Ovation Award-winning Fame, and this year’s 13: The Musical, Bring On Tomorrow Co.’s talent-packed cast will inspire with this story of familial love and female independence – two ideals that are just as relevant today as they were 150 years ago. 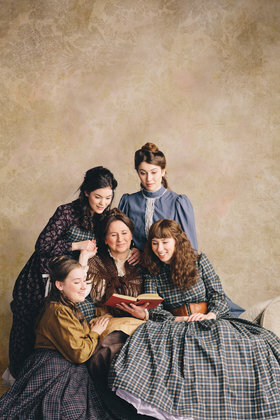 Filled with love, laughter and lament, this musical adaptation of Louisa May Alcott’s classic novel promises to have audiences falling in love all over again with Little Women.